Northern Italy was shaken by an aftershock Monday morning, a day after a magnitude-6.0 quake killed at least seven people and left thousands of survivors huddling in tents or cars overnight. Monday morning’s aftershock caused buildings to sway in the town of Finale Emilia, in Italy’s industrial heartland. The tremor had a magnitude of 3.2 and hit near the site of the original quake, according to the Italian Seismic Service. The head of Italy’s Civil Protection Department, Franco Gabrielli, said 11,000 people had been displaced by the first quake around 4 a.m. (10 p.m. Saturday ET) on Sunday morning. . . .
One church in San Felice, known as the Church of the Archpriest, practically imploded and is now only half its previous height. ‘We are thankful there were no casualties,’ said Simone Silvestri, a city council member, looking at the church surrounded by a sea of rubble. Among the art works in the church, and presumably destroyed or severely damaged, was a triptych painted on wood by 16th century artist Bernardino Loschi depicting the Madonna, St Geminiano and St Felice. Paintings from the 18th and 19th centuries used to adorn the sacristy. 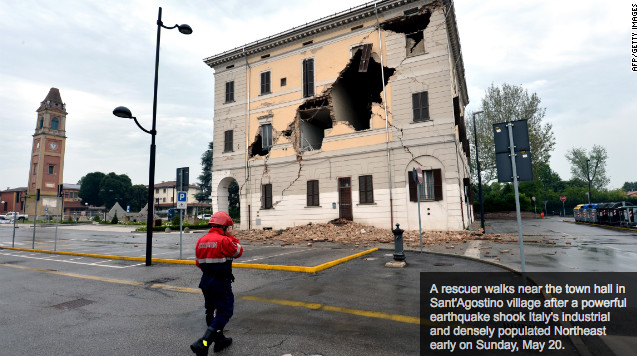 In the nearby town of Finale Emilia, a section of San Carlo church collapsed. It contained a painting by 17th century artist Giovanni Francesco Barbieri, who was known as Il Guercino.